After taking a bullet for the President he personally despised, Secret Service Agent Joseph Reeder collected his partial pension and called it quits. Now he operates his own security business in the nation’s capital and is fairly content with his life. All that changes when a Supreme Court Justice is shot dead during the audacious daylight robbery of a swank D.C. restaurant. Reeder is recruited by Gabe Sloan, an old F.B.I. friend, to help with the investigation. Nicknamed “Peep” by his former associates, Reeder is a student of kinesics; the art of reading body language and his observation skills are legendary. Asked to examine video footage of the robbery and shooting, Reeder is able to see through the subterfuge of the incident and discovers that the Justice’s murder was in fact a deliberate assassination. Sloan has him report his findings to his superiors at the Bureau and an inter-agency task force is put together to find the killers. Twenty four hours later a second Justice is gunned down outside his home and what had begun as an isolated act of violence is quickly turned into a full-blown threat against the highest court in the land. In Joe Reeder, Max Collins has invented up a compelling, quirky and totally believable hero caught up in a twisted mystery with enough twists and turns as to leave a crossword junky dizzy. Teamed with Patti Rogers, a smart and tenacious F.B.I. agent, Reeder is a modern day Sherlock Holmes matching wits with an unknown advisory whose ultimate goal is nothing less than altering the landscape of American jurisprudence for generations to come. Collins’ ability to capture the social and political schism of our times delivers a truly frightening and plausible scenario. 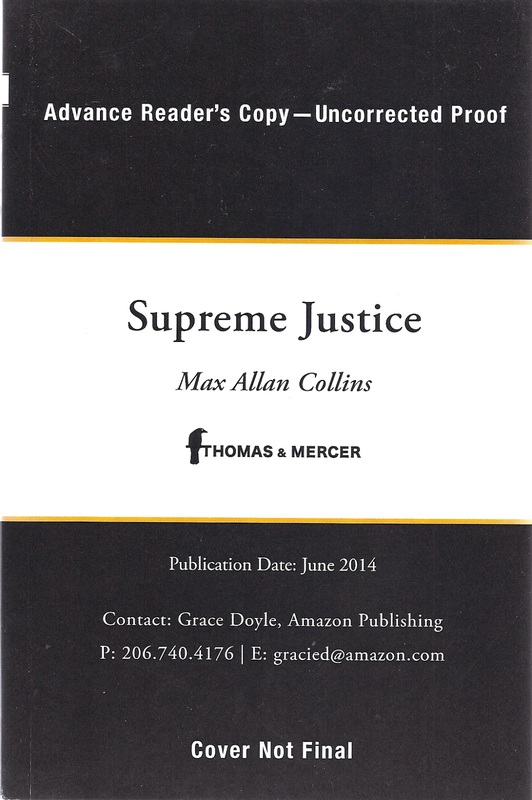 “Supreme Justice” is a taut thriller you will not be able to put down once you’ve picked it up. This is a master at work. The title to this book intrigued us when we were first contacted by the publisher’s marketing representative. In the write-up we learned this was a thriller whose plot revolved around a possible British heir to Adolf Hitler. The book delivers that in a straight forward, slightly humorous vein that almost skirts the side of a Black Comedy, though it is clearly not that. Matronly Jean Hastie is a Scottish art historian and as far removed from the traditional hero-figure most of us are use to seeing in such conspiracy tales. When her childhood friend, Monica Sterling, whom she has not seen in many years. is murdered on her own doorstep by an all-girl street gang high on drugs, Jean travels to London to see after Sterling’s only daughter, Melissa, who is also her goddaughter. Upon her arrival, she learns from the police that Mel is the primary suspect in her mother’s murder. Then, Jean discovers Monica’s secret diary and learns the truth about her old school chum. Monica was the daughter of a flighty British heiress, who, as a young woman, traveled to Berlin and was seduced by the leader of the Third Reich. Born on a secluded island off the Scottish coast, the baby girl was given up to adoption by the secret society that had manipulated her birth in the first place. Before the end of the war, Hitler and his stooges had locked away millions of dollars in a Swiss Bank account. The account numbers were given Monica’s real mother and then later, in a very surreptitious fashion, passed down to her for safe keeping. Upon learning of her true lineage, Monica was repulsed at being the daughter of such fiend and vowed to never let the conspirators discover the account numbers. She is murdered only days after her last entry in the dairy and thus it is left to Jean to avenge her friend, save Melissa and thwart this new Nazis plot. All in a day’s work for a Scottish art historian who abhors violence. 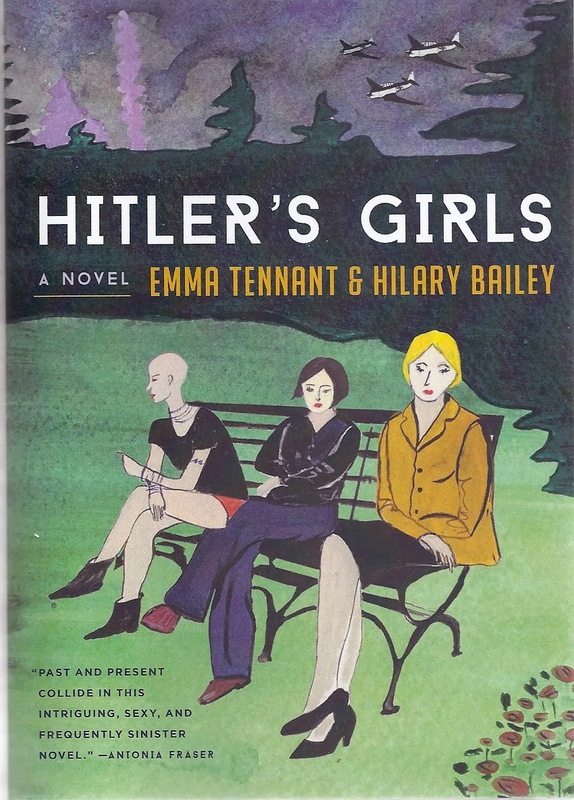 “Hitler’s Girls,” is something original in a well-worn genre and sparkles with both wit and suspense. As ludicrous as the plot seems, once the characters begin telling their tales, we were totally seduced by it all. One of the goals of Pulp Fiction Reviews is to showcase new and different books of quality and high imagination. “Hitler’s Girls,” fills that bill…and then some. Every single time I finish a new Isaac Bell book by Justin Scott, I feel both satisfied and sad. Satisfied in that Scott has one again entertained me with his exploits of the turn-of-the-century Van Horn Detective Agency’s chief detective; sad that I now have to wait for the next one. The real joy of this series is its setting in history at a time when science and technology were altering the world on such a grand scale; it truly was an age of marvels and wonders. In the midst of all these remarkable achievements, as is always the case, the eternal war between good and evil continued to rage. While wondrous inventions made the lot of mankind easier, lessening the burden of daily toil, it also provided men of power with the incredible tools to subjugate less advanced nations. Imperialism was on a crash course with democracy and a World War loomed just over the horizon. This is the era of Isaac Bell and the love of his life, Marion. 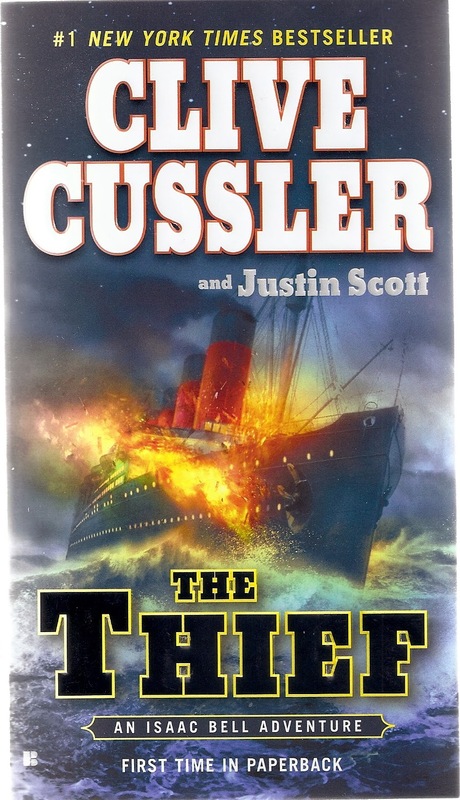 In “The Thief,” we are happy attendants at their wedding aboard the magnificent ocean liner, the Mauretania. At the same time, Bell fatefully comes to rescue of two scientists about to be kidnapped by German spies. He soon learns that the men have developed a new process that will make talking motion pictures possible. As Marian is a director of silent movies, she quickly educates her new husband on the importance of such a device and how it could revolutionize the media. Still, Bell is puzzled as to why the Imperial German Government is so obsessed with possessing what he sees as a mere entertainment device. Before the ship can reach the docks of New York, the older inventor is murdered by a German spy known as the Acrobat leaving only his young protégé with the knowledge of how to produce the new “talking” film machines. Bell vows to product the young man and escorts him to small town in California called Hollywood. Along the way Bell has to stop several attempts to kidnap the inventor, all orchestrated by the Acrobat. Although filled with authentic movie history set pieces, Scott keeps the action moving flawlessly leading up to a fantastic climax confrontation between Bell and the Acrobat you don’t want to miss. Thumbs way up on another great Isaac Bell novel.